Bonnie and Clyde: their names evoke a vision of two love-sick desperados who, in reaction to the economic calamity of the Great Depression, engaged in a bank-robbing spree across America's Mid-West. This image is greatly influenced by the 1967 film Bonnie and Clyde that romanticized the couple�s life of crime. In reality, Clyde Barrow was a cold-blooded killer who was joined by Bonnie Parker in a march of murder and mayhem that lasted from February 1932 to May 1934. They preyed upon defenseless targets including small-town banks, filling stations and mom-and-pop stores from Iowa to Texas. Their life of crime resulted in the deaths of at least nine police officers and an un-tolled number of innocent civilians. Twenty-three-year-old Clyde Barrow was released from a Texas prison in February 1932 after serving almost two years for various arrests that began in 1926. He was immediately reunited with twenty-two-year-old Bonnie Parker whom he had met two years prior. They quickly surrounded themselves with a gang of desperados that included Clyde�s older brother Buck and his wife Blanche. When not committing murder and mayhem, much of their time was spent speeding over the dusty dirt roads of the Mid-West in an attempt to keep one step in front of the law. The end for Bonnie and Clyde came on the morning of May 23, 1934 as their car roared down a rural road east of Shreveport, Louisiana. They sped unexpectedly into an ambush that had been prepared for them by a six-man posse consisting of sheriff�s officers from Louisiana and Texas. When the couple�s careening car came into view, the law officers, concealed in the surrounding brush, unleashed a fusillade of fire power that decimated the vehicle and instantly killed its occupants. 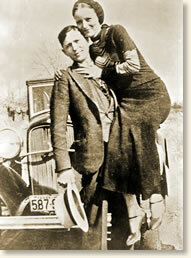 The crime spree of Bonnie and Clyde was over. "They've killed Buck! I shouted to Clyde!" "I wasn't quite asleep, just starting to doze, when someone flashed a light on our window and door. Then someone knocked. I woke Buck and told him there was someone at the door. Then I jumped over the foot of the bed and began putting clothes on. Buck told me to ask who it was and what they wanted. They told me it was the law. Buck began to put his trousers and shoes on. The man at the door told me to send out the man I had in there. I whispered to Buck, asking what to say. 'Tell them there isn't any man in here,' he said. So that's what I told them. 'Well,' the man said. 'Put your trousers on and come out yourself.' I asked again what they wanted, stalling for time. I felt the end was near for all of us. Then he asked where the men were. 'Tell them the men are in the other cabin,' said Buck. 'And shout it loud enough so Clyde can hear you.' So I told them the men were in the other cabin. 'Well, come on out here yourself' the man said. described in this eyewitness account. Buck grabbed one pistol, a .45, and put it in his belt, then got the rifle from beside the bed. Suddenly it seemed as if the men outside were driving a car through the garage door, or trying to knock the cabin door down. Then the fireworks started. I don't know who fired the first shot, but I do know Buck shot at the corner of the room instead of through the door where he could have killed anyone in front of it. He had said he didn't want to kill anyone. Those who were in front of our cabin should be thankful they were not in front of Clyde's cabin instead. They would have been dead men because Buck could see their shadows against the window and through the glass panel in the door. He could have killed them if he had wanted too. After he started shooting, Buck began firing through all the windows, cocking the rifle as he moved from window to window. I stayed as close to Buck as I could. At one point, he accidentally hit the dresser with the guns stock and broke the mirror to pieces, Then the shooting stopped as suddenly as it had started. The car that seemed to be breaking down one of the garage doors started backing away with its horn screaming. We thought this meant they were calling for more help, but I later learned that some of Clyde's shots had found their mark, passing through the officers' armored car and wounding one officer in both knees. Another bullet struck the horn and caused it to blow continually. 'Are you alright?' Buck called out. 'Yes,' answered Clyde. 'Are you both still okay?' 'Yes,' we both said. 'Let's get away from here!' Clyde said. I opened the door. I meant to go out first, hoping they would shoot at the first one so Buck would have a chance to get to the car. Then we heard the motor of Clyde's car start. 'Okay,' he said. 'Let's go. Get the bag by the door.' I did. We were outside. I was about halfway to the car when a shot rang out from the station. I turned and screamed. I saw Buck fall and ran back to him. I wasn't afraid anymore. If he were dead, they could shoot all the lead they had into my body. I didn't fear the bullets. 'They've killed Buck!' I shouted to Clyde. Clyde came out and asked where the shot came from. I told him. Then he picked up Buck's rifle. The barrel was so hot it blistered his hand. It was about all I could do to lift Buck up and get my arm around his waist so I could get him to the car. I lost all feeling. My body was numb. After I got him up, I couldn't even feel his weight. How I got him to the car alone I'll never know. And I still had the bag in my right hand! I had a little difficulty getting Buck into the car. His head bumped the side of the garage. I tried so hard not to hurt him anymore. I finally got him in the car. W. D. got in beside me. I was in the center. Buck was on my right, W. D. on my left. Clyde got in, stepped on the gas, and backed out of the garage. W. D. asked for a gun. Buck mumbled that he had dropped his gun and then lost consciousness. I was holding his head as close to my breast as I could, and had both my arms wrapped around him, trying to protect him should the officers shoot into the car, as I was sure they would do. My face was turned toward the right side of the car and I had my head bent as near Buck as I could. Then a hail of bullets was fired into the right side of the car. I couldn�t protect my face because I was trying to shield Buck as much as I could. Glass broke. Something hard hit the side of my head. I was also struck in my right arm, though I didn�t feel it at the time. But none of the glass or bullets hit Buck. Then my vision suddenly faded out. All was dark. I thought my eyes had been damaged by bullets and glass. But I felt no pain. I was past feeling pain. Then, when hot blood began to stream down on my face, I thought some of it was water from my shattered eyes. This eyewitness account appears in: Barrow, Blanche Caldwell, My Life with Bonnie and Clyde (2004); Burrow, Byran, Public Enemies: America's Greatest Crime Wave and the Birth of the FBI, 1933-34, (2009); Milner, E.R., The Lives and Times of Bonnie & Clyde (2003). 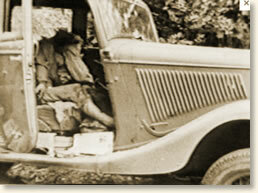 "Shoot-out with Bonnie and Clyde, 1933" EyeWitness to History, www.eyewitnesstohistory.com (2012).